I always love one pot meal, it appeals in the way you can simply have everything in on go and you have your meal ready. 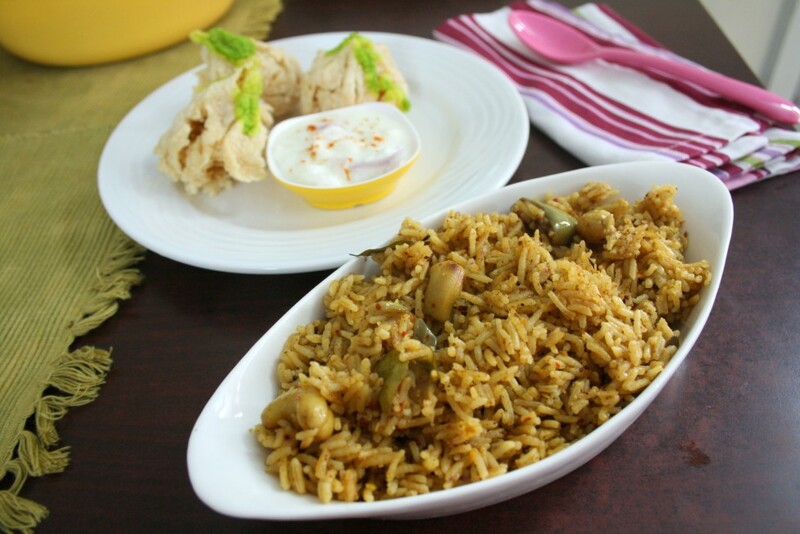 However at times, when I end up making a pulao that’s not so spicy, I am forced to think of a gravy again. When defeats the purpose of having a quick one pot meal right. That’s one of the reasons why I stopped doing it on a weekly basis. However when I selected to make Maharashtrian Lunch dishes, I was coming across this eggplant or Vangi Bhath, too often for my own comfort! 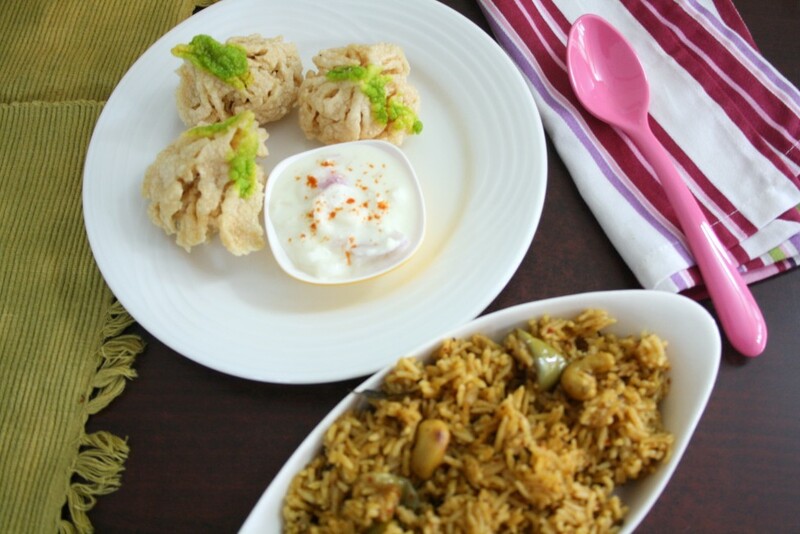 Now one of the ways I like to eat Brinjal, if not the actual vegetable, at least to cook it, will be a Vangi Bhath. Otherwise, I love our Nune Vankaya Kura. Every time I think of Brinjal, Vangi Bhath comes to mind and I remember my college days when Amma used to make it often. Then as with most dishes, it took a back bench, to be rediscovered after a long time, when I made it for a BM theme. Anyway coming to the Vangi Bhath that’s common in Maharastra, they use Goda Masala along with more spice. Now I must say this is our kind of spice and for the side dish I just made raitha! And before you ask, yes I mad Goda Masala at home. It’s for another occasion when it is going to surface. 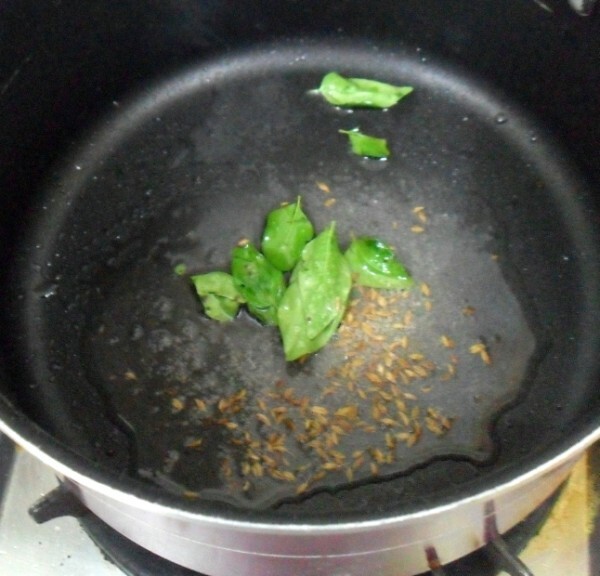 I really wonder how naive I was, years back when I attempted Maharashtrian dishes and made Masala Bhath. I had no clue on what Goda Masala was, however as the recipe said I could replace it with garam masala, I simply did that. It’s been years ago and I have come a long way! Being a food blogger has many merits, greatest is for sure, the insight we get by reading so many wonderful blogs. And one of the pleasures has been, about still continuing to do Indian Cooking Challenge and finding blogs that are treasures. So this theme about regional cuisine is very close to heart and I really enjoyed. As I said I am not sure how authentic my dishes turned out. I stayed true to the recipe, though spice levels were adjusted and sugar was completely ignored! I liked what I ended up cooking and that’s what matters I feel in the end. Yesterday was hubby dear’s birthday and kids along with my niece and nephew ensured they made the occasion a memorable one. Though I wanted to bake a cake, I ended up getting an eggless chocolate truffle. You can imagine the scene at home and the excitement that followed on opening up the box! The cake disappeared within minutes! And I managed just a piece. Anyway, we loved the art all of them did for him and the entertainment they gave us after the cake cutting. Coming back to the recipe, I know that vadiyalu are looking very colourful with the green on the tip right? Well, those are store bought, rather homecooked stuff, got from my SIL’s place. Very artistic right. 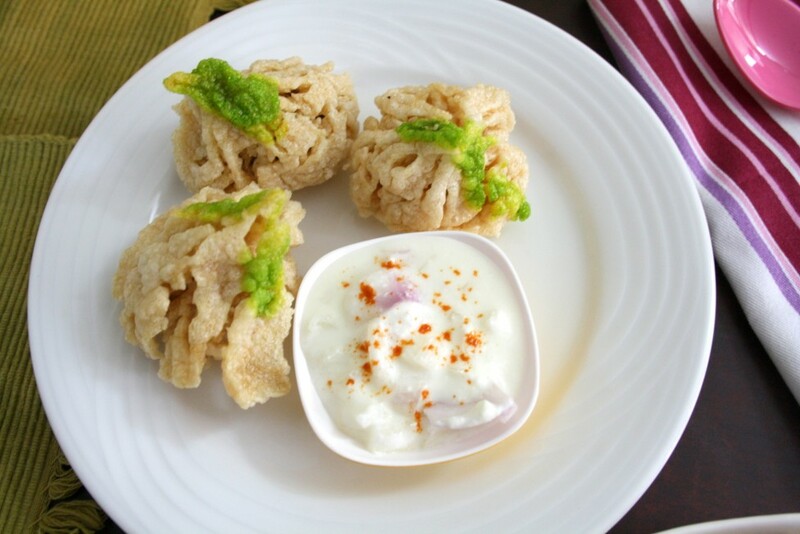 We enjoyed them with the spice Vangi Bhath. Roast the ingredients for the spice powder. Grind to a fine powder once it is cooled. 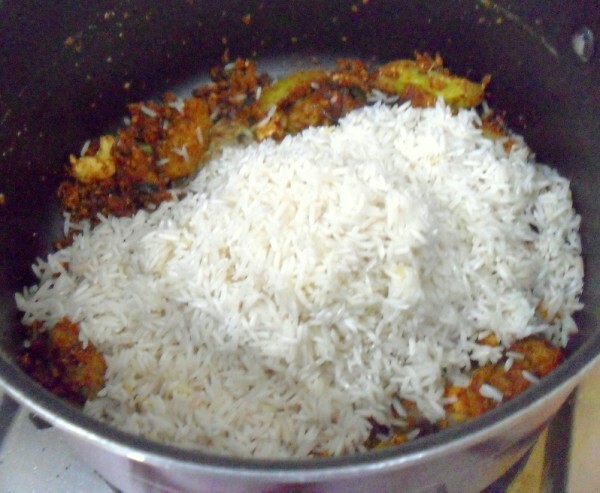 Wash and soak the rice in water for 15 – 20 mins. In a nonstick pan, heat oil. 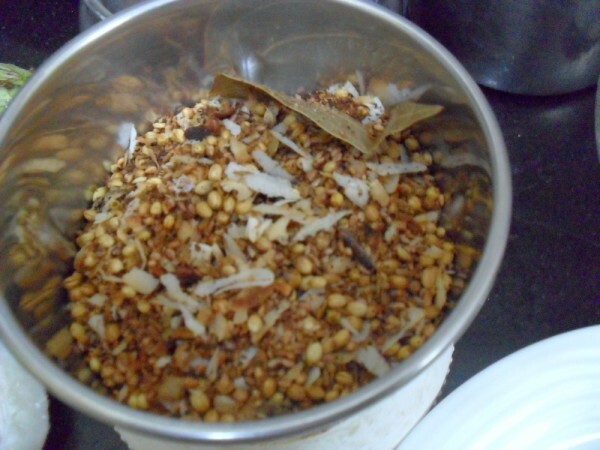 Temper with mustard seeds, cumin seeds, hing, curry leaves, cashews. 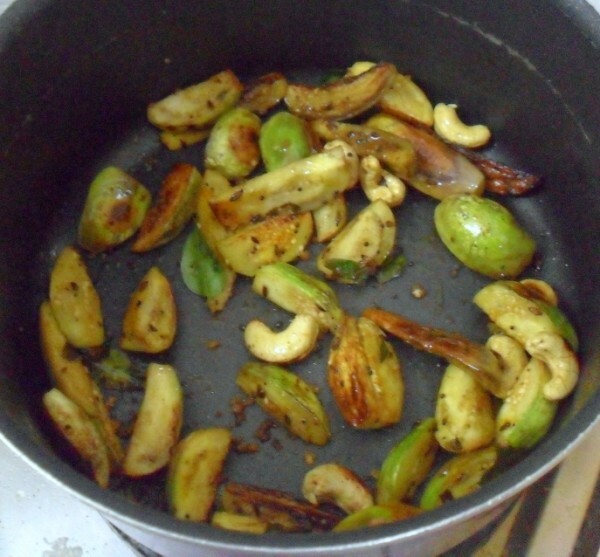 Next, add the chopped brinjals, salt, and simmer for 5 -7 mins so that the brinjals get soft. Add the ground masala. Combine everything well. 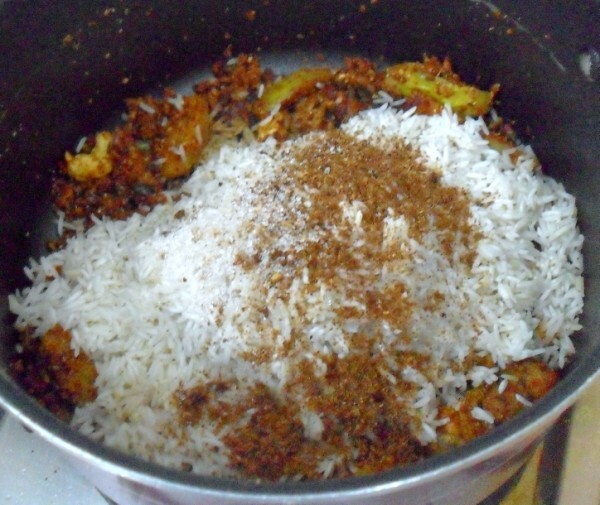 Now add the drained rice and fry for a couple of minutes. 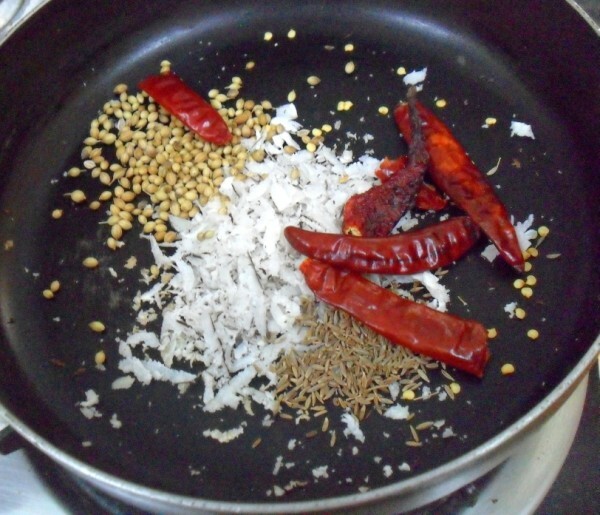 Add the goda masala and combine everything well. Next, add the curds and mix. Once everything is combined, add 2 cups of water. Bring to boil and simmer. 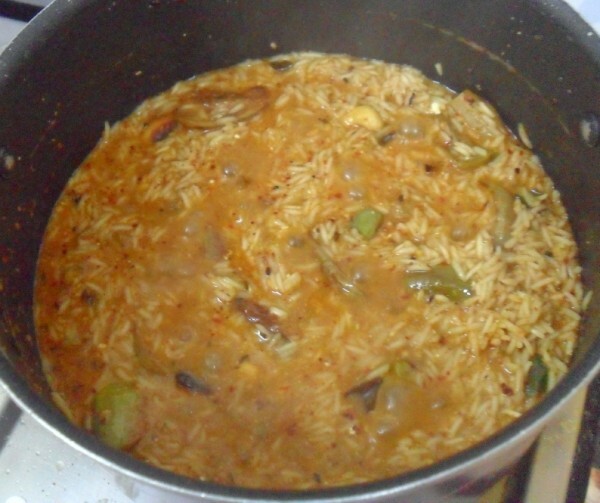 Cook on medium-low heat until rice is cooked. 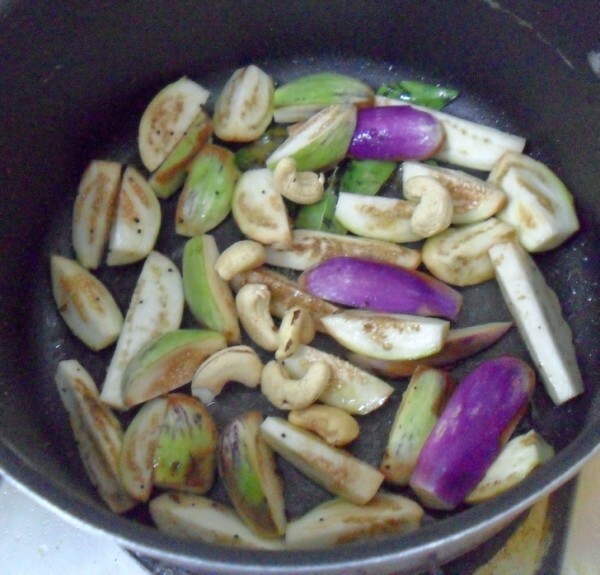 Other veggies like Tindora can be substituted in place of eggplant. The original recipes call for a little sugar / Jaggery to be added. I avoided as we don’t like sweet in spicy. Final garnish can include fresh Grated Coconut or dry. I skipped this. 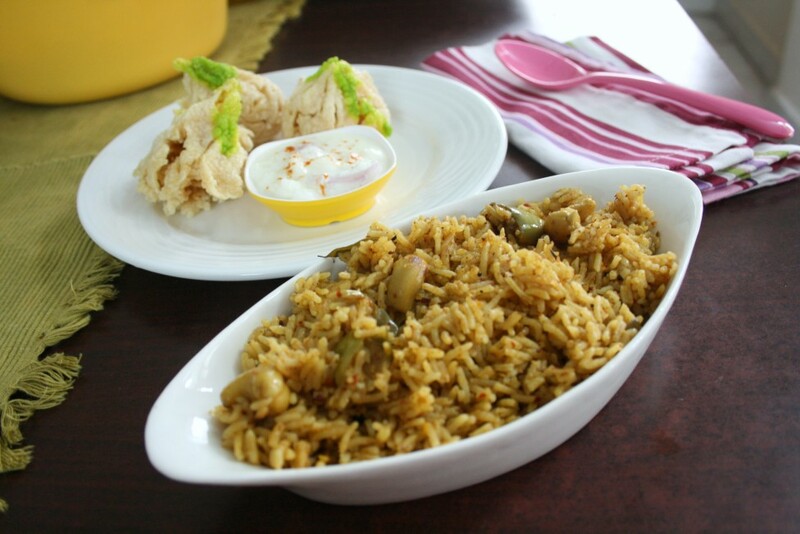 Get ready for another Rice dish to make your lunch easy! 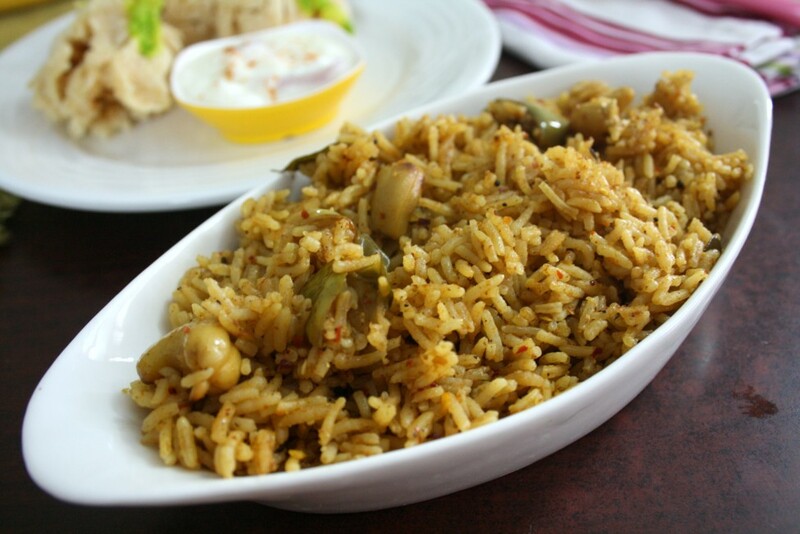 Brinjal is my favorite, This rice in particular!!! Love the combination of spices!!! Looks so wonderful and delicious one pot meal! Vangibath looks highly flavourful, makes me hungry after having my dinner. Love this recipe already in my to do list. 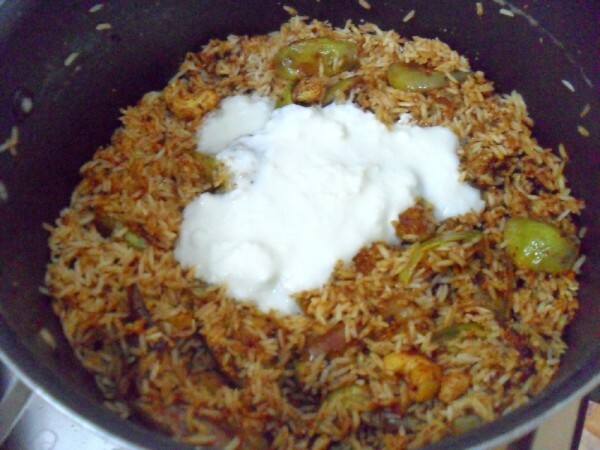 this is my favourite rice recipe…. Oh yumm!! Bookmarked, you know my love for everything eggplant 🙂 Never tried it with goda masala, will try this soon. Belated B'day wishes to your hubby. The color of the brinjals is so beautiful. ..and the rice looks yum..the godha masala has a unique flavor and is best made at home.oh ya I like those pretty fries. My friend was mentioning the staple Goda masala which they use for many things and I am sure this vangi bath tastes flavorful as well. Such a flavor full rice. You have not mentioned at what stage should the spice powder be added. Also what about the yoghurt mentioned in the recipe? Neerja, Thanks, I have updated it, the steps were mentioned in the pictures.